How do you turn a relatively unsuccessful e-government (or ICT4D) project into a relatively successful one? There’s not a lot of guidance on this question. Lists of success and failure factors are generic rather than specific to any one project, and need to be analysed before the project starts. Evaluation methodologies focus more on impact than implementation, and generally apply only after the project has ended. What is needed is a “mid-implementation toolkit”: something that will both analyse where you’ve got to in the project, and recommend an improvement action plan for the future. Researchers working alongside an Ethiopian e-government project have recently published the results of testing just such a toolkit. Using the “design-reality gap” framework, the researchers gathered data from four different stakeholder groups involved with the e-government project, which had introduced a land management information system into one of Ethiopia’s city administrations. The system was only partly operational and was not yet fully integrated into city administration procedures: it could therefore be described as a partial failure. 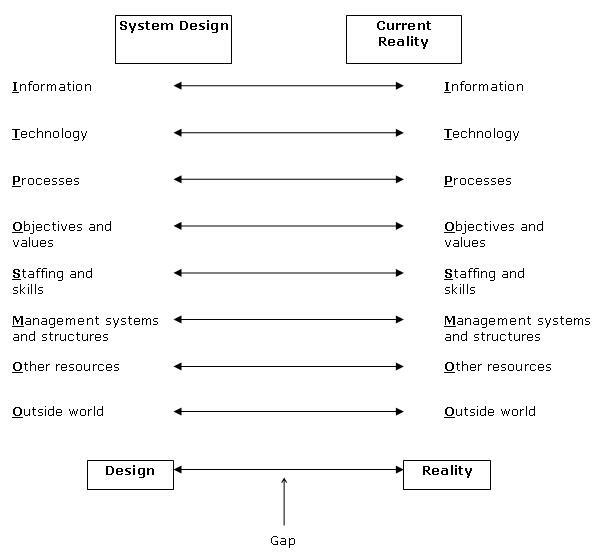 The design-reality gap framework helps measure any differences that exist between the project’s initial design expectations and current implementation realities. It does this along seven dimensions (see figure below). Management systems and structures (a failure to set up an ICT department and to hire permanent IT staff). Staffing and skills (hiring only five of the required nine IT staff, and undershooting the necessary qualifications and experience). Project objectives and values (allowing some culture of corruption to remain among lower-level administrators). Information systems (absence of one core system module and of digitised documents). These gaps demonstrated that the e-government system had not yet institutionalised within the city government. The gap analysis was therefore used as the basis for a discussion with senior managers. From the analysis and discussion emerged two things. First, identification of small gaps that had lain behind the partial success of the system – the commitment of project champions, process re-design being conducted prior to introduction of new technology, and stability in the information that was digitised onto the e-government system. Second, identification of an action plan that would close the main extant gaps between design and reality: creating the proposed new ICT deparment, hiring additional IT staff, and setting up permanent positions with clearly defined salary scales and promotional criteria. These, in turn, would provide the basis for implementing the missing module, and scanning the missing legal documentation. Not all the gaps can readily be closed: it will take a much longer process of cultural change before the last vestiges of corruption can be eliminated. Nonetheless, design-reality gap analysis did prove itself to be a valuable mid-implementation tool. It is helping steer this e-government project from partial failure to greater success. And the authors recommend its use by e-government managers as they implement their projects: it has helped to focus management attention on key e-government project issues; it digs beyond just technical issues to address underlying human and organisational factors; and it offers a systematic and credible basis for project reporting and analysis. Feel free to comment with your own experiences of design-reality gaps, or other mid-implementation techniques for e-government project analysis and improvement.